Greetings again dear friends of Harmony Hill. As I shared in the first blog this post is on opportunities that came from discovering St. Andrew’s House (pictured to the right) at a women’s retreat Feb of 1985. In his life St. Andrew’s illuminated peoples’ spiritual responsibility to one another. Unconditional love is intrinsic to the powerful healing that occurs at SAH and at Harmony Hill (HH). Volunteering in the gardens and kitchen at SAH affirmed my need to have a “hands-on” relationship with the earth for my grounding…true to this day. The winds of grace were blowing those early years. It was an incredible year for the birth of the calling for the creation of a wellness center next door now known as Harmony Hill. In each coming blog, I want to highlight the “Weavers” who helped craft the tapestry that is now HH, without their involvement this project would not have emerged. People began showing up. Jean Moore a joy-filled neighbor introduced me to Elaine Cook, a retired sociology professor who lived just down the road and became interested in my wellness center dream. She was a wonderful gourmet cook with garden seeds from all over her world travels including 11 kinds of exotic lettuce…later became a Board member and wrote our first HH cookbook even as she was going blind. 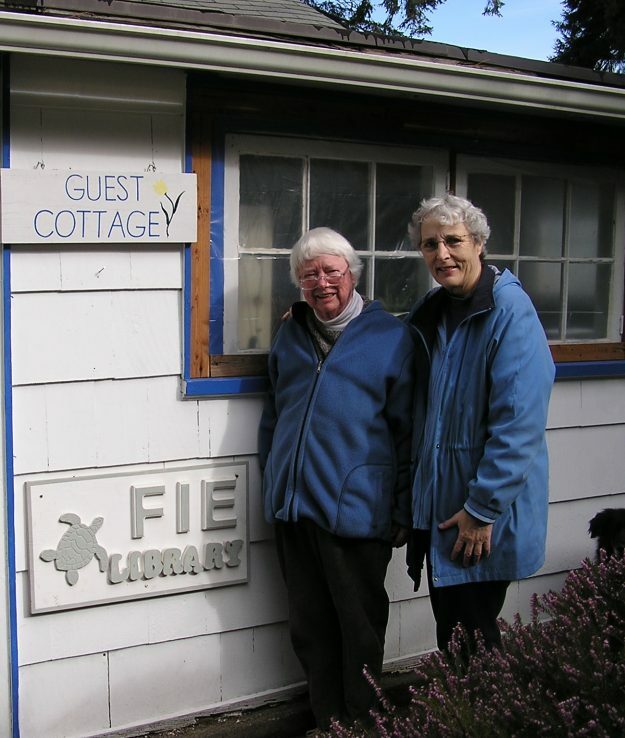 Both Jean & Elaine used “Carpe Diem” as a theme for their lives and were instrumental in founding the “FIES” (Fiercely Independent Elders) meeting for years in the HH cottage. Thanks to the help of Mary Williams and Carolyn Olsen we started a project at SAH that was called McDAP ( Mason Co. Drug and Alcohol Abuse Prevention) which quickly grew and needed more space than a file drawer at SAH. I approached the manager of the Callison property next door about renting a room. He invited me to care-take the large house (now the Lodge) in exchange for a small room which I moved into Feb. 1986. The house was void of any furniture except a piano, Christmas cactus, and a couple of beds. Early days were fledgling, rocky at times. I was working at 3 part-time jobs to cover expenses; some friends including members of my family thought I was nuts giving up stable credible employment yet amazing people came to help— Within a month the owners asked me to find a lessor for a minimum of one year for the house…a difficult task since the property was for sale. Fa. 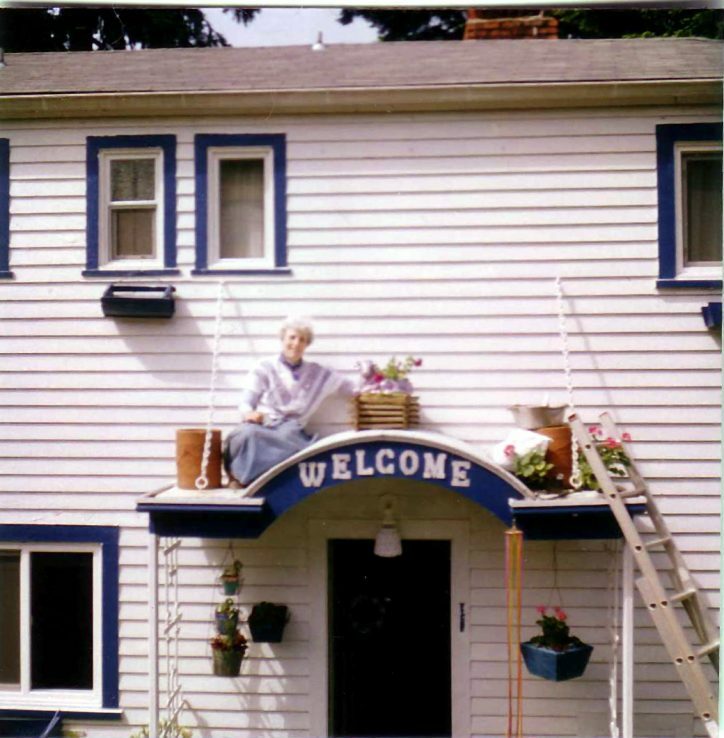 Jack Gretz became my spiritual director and shared that he thought this project could be a “Spiritual Boarding House” for all kinds of people in need. Thanks to another dear neighbor Gail Baker I met Andy Bell—an amazing quadriplegic committed to wellness who was willing to help the development of this house as a respite place for himself and others in wheelchairs. The name Harmony House was selected as a place to tune in, tune out, tune up or tune down, whatever fits. A few years later we changed the name to Harmony Hill to reflect organizational evolution and the sacredness of the land… a place for people to reconnect with themselves and the earth for healthy living. During these first few years, numerous special people influenced our growth. My cousin Louise Kelly and dear friends/colleagues Joy Carey, Bill Lerner, Les Purce, Shirley Harris-Lee, and Joan Wilson gave much affirmation and heartfelt substance to the dream. In 1988 the property was purchased by Kitty and Elmer Nordstrom. Their willingness to allow us a long-term lease has been an honor and grace-filled privilege. We were totally blessed to have known these kind and benevolent people who opened the doors to expanding Harmony Hill to what it is today. – THANK YOU! “Thank you, Thank you. This has been wondrous in so many ways that I can’t express adequately. We felt held, loved, listened to all weekend. It has been lovely and transformative, so again, thank you!! Part #3 will focus on the role of Elmer & Kitty Nordstrom, as foundational weavers in what would become our Cancer Program, as well as a few of my volunteer adventures as a member of Union’s fire dept. Stay tuned! I deeply appreciate your comments and support. 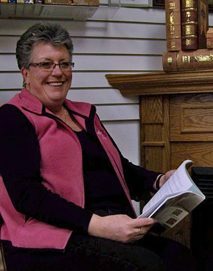 Written by Gretchen Schodde, Founder, Executive Director Emerita. I love hearing how this magic, this mission of healing came to be. Gretchen was amazing as a fellow student nurse at Tacoma General in the 60s and even more so in the intervening years. Harmony Hill is magical for all. Those living while dying and those living while seeking inspiration. I love all the details of this wondrous and amazing journey. The sacred land and programs are life changers for so many experiencing the challenges of life …may they be medical, emotional and/or spiritual. The commitment of Gretchen, leaders and unbelievable staff make our time there so rich, nourishing and healing. Thank you!